This is a high quality folding knife made by Cuchilleria Joker in Spain. The blade is made from top quality 420 stainless steel and the cutting edge is 8cm long which is above the UK legal length, therefore it cannot be carried in a public place. The handle is made from Oak wood. (We also stock this knife in an Olive wood finish NO21). The knife features a virolock system which is a locking mechanism designed to prevent the blade from closing when in use. It is similar to the No.6 Opinel knife but the Joker has a thicker blade makeing it easier to open as there is more blade to get hold of. As the shape of the knife handle is curved more of the spine of the knife is exposed which also facilitates the easy opening of the blade. So what do our instructors think? 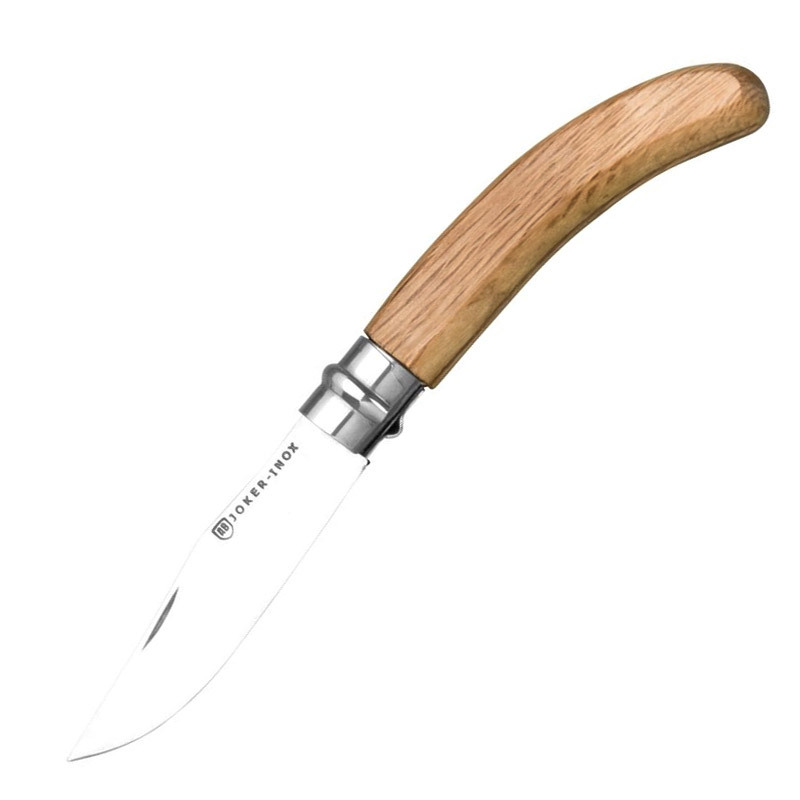 "A good quality alternative to the Opinel blades featuring a drop point at the end of the blade. Personally I prefer the Oak wood finish as apposed to the Olive wood, the knife is lightweight and sits comfortably in the hand, it is easy to use and has a shave sharp edge." Advantages: Stainless steel blade, holds its edge longer than carbon steel blade. Virolock system to prevent closing when in use and prevents the blade opening when in transit. Thick blade therefore easier to open. Disadvantages: Harder to sharpen than carbon steel blade. Cannot be carried in a public place due to blade length and locking mechanism. I had a string of losing opinels and bought this to replace them, I wanted a change I guess. I used the opinels just for day to day living and in a wild camping context - I don't use them for heavy serious work, sometimes cutting down sticks at camp or wittling, cutting up food and cord and the like. The blade on the joker seems fairly similar to opinels. The curved handle does give a better grip and is a good size for my hands but I have small hands. It's not quite as comfortable as the opinel when held in reverse for simple things like cutting and peeling fruit. The locking ring doesn't seem as well made as the opinel - when the blade is locked shut there is quite a lot of flex from the ring but none when the blade is locked open so I don't get the impression it would fail as a locking mechanism, just an observation. There is much more of the blade showing when closed on the joker than the opinel which will be a godsend, I am sure users know trying to open an opinel with a stiff hinge with wet and cold hands on the hillside can be truly frustrating. Overall, in the price range, and the intended markets, either this or the opinel is perfectly fit for purpose.